Green has gone mainstream. Not too long ago, just a small group of deep green consumers existed. Today, 83% of consumers (Source: Natural Marketing Institute, 2009) - representing four generations, Baby Boomers, Millennials, Gen Ys and Gen Zs - are some shade of green. Each in their own way, these generations are quickly transforming what used to be a fringe market that appealed to a faction of eco-hippies is now a bona fide $290 billion industry ranging from organic foods to hybrid cars, ecotourism to green home furnishings. Teen daughters of yesterday's activist moms search out Burt's Bees lip balm made from beeswax while their "twenty-something" brothers opt to clean their new digs with Method ‘s cucumber-fragranced dish liquid. Today's Dads boast of higher mileage, fewer fill-ups, and the peppy look of their new Mini Coopers or diesel-powered Jettas that get 50-plus miles to the gallon; expect their Gen X sons to be kicking the tires of Nissan's electric Leaf, now heading towards showroom floors. Thanks to advances in materials and technology, today's "greener" products (defined as having a lighter impact on the planet than alternatives) and today's more "sustainable" products (those that add a social dimension, e.g., fair trade) now not only work well, they likely work better and more efficiently than the "brown" counterparts they were designed to replace. Channels of distribution have changed have changed, too. 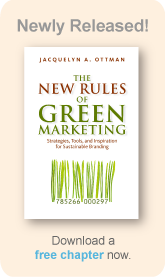 As I point out in my just released book, The New Rules of Green Marketing (Berrett-Koehler, February 2011), today, sustainable products are readily available in conventional supermarkets such as Fred Meyer and Safeway, brightly lit emporiums such as Trader Joe's and Whole Foods Market, while mighty Wal-Mart leads the charge towards lifecycle-based standards for products through its groundbreaking Sustainability Consortium. Once confined to open spaces and rooftops, solar power is now mobile, fueling a modern-day, on-the-go lifestyle embedded in cellphone chargers, backpacks, and even the latest fleet of powerboats. Or confined to the tissue boxes or wrappers of days gone by, recycled content is now good enough for Kimberly-Clark's own Scott Naturals line of tissue products (with its new "coreless role") and Staples' EcoEasy office paper, Patagonia's Synchilla PCR (post-consumer recycled) T-shirts made from recycled soda bottles, and Aveda's Uruku cosmetics packaging made from recycled newsprint, to name just a few. A sure sign that caring for nature and the planet and the people who live here now and in the future is here to stay - "Sustainability" is a core value of every living generation, starting with the Baby Boomers, the nation's primary household shoppers and societal leaders who led the green charge back in the mid to late-1960s, and extending right through to Internet-savvy Generations X, Y, and Z who promise to transform markets as future decades unfold. The consuming power of the four current generations is remarkable if marketers can target them by what appeals to them uniquely. Now the heads of millions of U.S. households, the Baby Boomers and been influencing society since the 1960s when they planted the seeds of the modern day green movement when as idealistic youths, gathered to celebrate the first Earth Day, in 1970, followed by the first Solar Day in 1971. Their peaceful demonstrations of concern gave rise to the National Environmental Policy Act of 1969, the founding of the US Environmental Protection Agency in 1970, the Clean Air and the Clean Water Acts that same year, and the Endangered Species Act of 1973. The Middle East oil embargo, marking the beginning of the energy crisis of 1973-75, then focused the Baby Boomers on the need for smaller, more fuel-efficient cars. Witnesses to the 1979 the release of the fictional The China Syndrome, a movie about safety cover-ups at a nuclear power plant, serendipitously opened at theaters two weeks prior to the partial core meltdown at the Three Mile Island nuclear-generating station near Harrisburg, Pennsylvania. They learned first hand about the need for renewable energy. Taking the values and attitudes they have instilled upon society and have imparted to their children and grandchildren to supermarket aisles, today, over half of Baby Boomers consider themselves socially conscious shoppers. That's 40 million green boomers who, as illustrated in the chart below. choose to organize, pluck resource-conserving products from the shelves, boycott products of companies that pollute, and "pro-cott" the products of companies that give back to the community. CNN brought global issues into the living room of this generation 24/7. Counting among them actors Leonardo DiCaprio and Cameron Diaz as two of the most outspoken environmentalists of their generation, Gen Xers see environmental concerns through a lens that aligns social, educational, and political issues. They witnessed the fire in the Union Carbide plant in Bhopal India, and the aftermath of the explosion in Chernobyl. In 1985, the Live Aid concert helped to instill in them the need for famine relief in developing nations to an unprecedented 400 million worldwide, and more pointedly, in 1989, Gen Xers saw the massive devastation wrought by the Exxon Valdez oil spill in Alaska. This generation grew up in front of computers and unleashing the power of the Internet is second nature to them. Having lived through Hurricane Katrina and the BP Oil Spill, and with growing awareness of the Great Pacific Garbage Patch (the size of Texas), they tend to be distrustful of government and authority, and are quick to challenge greenwash and other marketing practices they deem to be unauthentic or untruthful. With their majority believing that humans cause climate change and the Millenials (aka Gen Y) are twice as likely to buy green products than those who believe climate change is occurring naturally. Green is an integral part of this generation's college experience. Legions of students now opt for newly created environmental studies courses (and majors) and are active in campus sustainability initiatives. Reusable water bottles and coffee mugs are ubiquitous on college campuses where many savvy companies now reach out with sustainability messages to future householders with significant incomes. Not content to sacrifice all for the almighty dollar, Millennials seek to balance "quality of life" and the "quest for wealth"; they seek to work for socially conscious employers. As the offspring of the Baby Boomers whose social and environmental values they share, Millennials are the likely new leaders of the modern-day green movement. With the ability to express their opinions through blogging, texting, and social networks, they are capable of mustering immediate responses from millions around the globe. The first generation to be brought up entirely in an environmentally conscious world, green is part of their everyday life. This generation - currently under the age of 16 - think nothing of living in solar-powered homes with a hybrid car in the driveway. In school and at home the 3Rs of waste management, "reduce, reuse, and recycle," are as common as the 3Rs of "reading, writing, and 'rithmetic." Sorting paper and plastic for recycling is a normal part of "taking out the trash." As school kids, they likely viewed The Story of Stuff, a 20-minute animated video that divulges the environmental impact of our daily consumption. Environmentally sensitive cleaning aids, locally grown produce, and recycled-paper goods likely top their parents' shopping lists; clothes made from organically grown cotton and biobased fibers are part of their own Gen Z uniform.